I remember the times when I spent my days changing diapers and feeding a baby and going to mom and tot swimming lessons. I remember that baby smell...oh so good. I remember nap time. 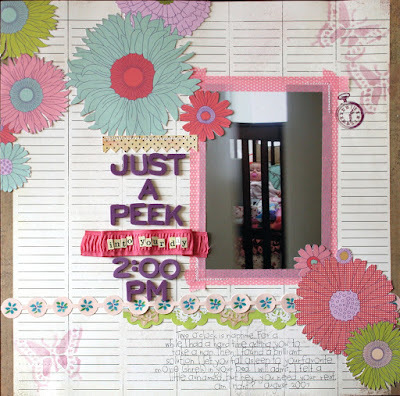 Supplies: PP - Basic Grey, American Crafts, Sassafras; Stickers - Sassafras, American Crafts, Girl's Paperie, Cosmo Cricket; Decorative Tape - American Crafts; Ribbon - American Crafts; Rub-on - Making Memories; Spray Ink - Tattered Angels; Pen - American Crafts. Malia has always been a good sleeper. Always. Since babyhood. But she is 5 now, and won't take a nap anymore. Even if she needs it desperately! Even if she is crying and screaming and saying 'I'm not tired! It does not mean I'm tired if I cry, Mom!'. Ha. Yeah right. For now, I just have to relive my memories because nap time ain't happenin. I love that photo! What a great idea!